A transplant to the Eastern Shore of Virginia, Henry Miller Terry was born on Long Island, New York in 1882. Himself descended from generations of sailors and watermen, Henry Miller Terry left school early to work for his father aboard his father’s sailboat, the Miss Sadie. Aboard the Miss Sadie, he traveled the Atlantic coast—often with shanghaied crews—hauling fruit from South America for his father. On the way back up the coast, Captain Terry and his son, Henry, would stop to take on seed oysters in the coastal waters of Virginia. They’d secure these seed oysters in large nets, which they hung overboard on either side of the boat and carried back to New York’s Great South Bay to sell as transplants to the Long Island Oyster Company. On one such journey, Miss Sadie ran into a storm off of Cape May, New Jersey. Unable to outrace the storm, Captain Terry tied a rope to his son and sent him overboard to cut loose the oyster nets on both sides of the boat. When they pulled him back aboard bloodied, his clothes cut to ribbons from the razor sharp oyster shells, Henry Miller Terry decided he’d had enough of his father’s ship. 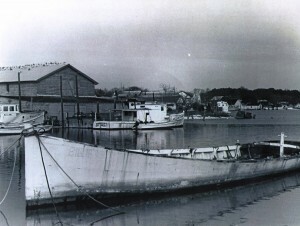 Soon after, a young Henry set out on his own, eventually moving to Willis Wharf, Virginia on the Eastern Shore of Virginia where, in 1903, he founded H.M. Terry Co. Founded originally as an oyster company, H.M. Terry Co was created with the express purpose of spawning, transplanting, growing, harvesting, processing, and marketing a branded oyster from the ocean waters of Virginia’s Eastern Shore. And with the company’s founding, the Sewansecott™ brand was formed. Joined by his two sons, Nat and Henry “Buzzy” Terry, the elder Henry Miller Terry established a platform of success upon which the company could grow, eventually passing the family business on to the second generation. During this time, H.M. Terry Co specialized in processing shucked oysters, and in 1980, Nat’s son, Pete, returned to the Shore—followed shortly after by his brother, Wec—to continue the family business as the third generation of the company. Through three generations, the family farming and processing operation flourished to a point in the early 1980’s when the company employed over 100 individuals and was processing and distributing over 100,000 bushels of Sewansecott™ Brand Oysters annually. This growth and success looked set to continue until suddenly, in 1988, the Eastern Seaboard was invaded by two specific oyster viruses, which all but wiped out Virginia’s oyster industry. Literally overnight, H.M. Terry Co went from a successful oyster company with a bright future, to a company without a product. Faced with hard times, H.M. Terry Co had to adapt or fold. Working extensively with the Virginia Institute of Marine Science, H.M. Terry Co began developing methods of farming hard shell clams, and over the years, through trial and error, we’ve remained on the cutting edge of farm-raised clam production and harvesting. 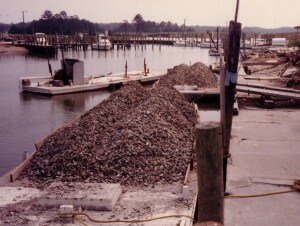 In that time, we have enhanced our hatchery operation to provide the best possible native clam product, and in the last several years we have expanded our facility to include the production of farm-raised oysters—returning to our oyster production roots while also offering the highest quality, ocean salt fresh clams! Today—now in the fourth generation of the family business — H.M. Terry Co produces over 40 million delicious, Sewansecott™ ocean salt clams and oysters annually. Hatchery produced from the best natural Virginia brood stock available, our oysters and clams are grown to market size in the pristine waters of Hog Island Bay, located within the 80 mile chain of undeveloped barrier islands of the Virginia Coast Reserve. This entire area used for oyster and clam grow-out has been designated and protected as a United Nations Biosphere Reserve, and our sustainable harvesting methods provide our customers with the highest quality shellfish year-round while also reflecting our dedication to ecological preservation. Known for our high standards of quality and our dependability in delivering fresh Sewansecott™ oysters and clams to our customers year-round, our future once again looks assured as the fourth generation of the family business carries the company into the 21st century.